From the fake abbey beer of yesterday, I moved to one of the most authentic beers of the 40b40: Cantillon gueuze, consumed right in the brewery no less. 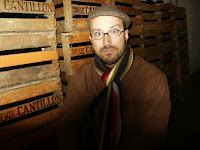 The Cantillon Brewery is a fantastic place where you really get the feel for brewing. This relatively small-scale family operation reveals how simple beer-making is when you get right down to it. You can see all stages of the process under one roof, and the size of the vats, while large, is still comprehensible and on a human scale. 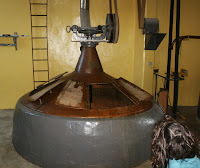 The self-guided tour also suggests how risky it must be to take up this type of traditional brewing as a business. 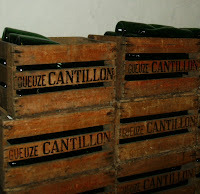 Cantillon relies on “spontaneous fermentation”, that is, they pour the warm wort (mix of water, grains and hops) into an open shallow copper pool, and a variable mix of naturally occurring airborne yeasts settle on it over night. These wild microfauna turn the grain sugars into CO2 bubbles and alcohol, which at Cantillon happens in beautiful wooden barrels. Until about 1860, when Pasteur’s discoveries made it possible to understand and control the fermentation process, this was how all beer was made for thousands of years. I guess no one had even the slightest clue what was making the raw ingredients into beer until then. They were just happy that it did. These days, big commercial brewers cannot afford to leave fermentation to chance like this, but Cantillon and a few other lambic brewers still do. 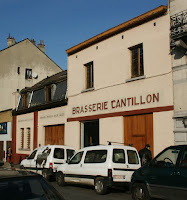 Cantillon is the last remaining traditional brewer in Brussels, however. There used to be hundreds. Anyway, after aging in the barrels for a year or three, the brewmaster samples several different barrels of lambics in order to mix them together to create a gueuze. The blending is obviously an art: young beers provide some sugar for additional fermentation in the bottle, but old beers are needed for flavour. In some cases, fresh fruit is added for flavour and colour. But fruit or no, all of these products are sour. The natural sugars from the grains, and from the fruit if added, are used up in fermentation, and unlike other beers calling themselves “lambic” and “gueuze” these days, the true traditional lambic does not. It seems quite a number of breweries went chasing the sweetening palates of consumers over the past few decades, but a few, like Cantillon, have stayed true to the form. 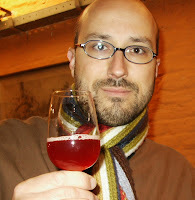 After a tour of the brewery, I tasted the gueuze and the raspberry-inspired lambic called Rosé de Gambrinus. 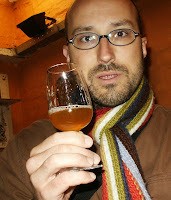 I’ve had what I thought were gueuze and fruit lambic before, but they had been sweet fluffy beers. These today were completely different. Sharp and sour, yes. But brilliantly floral, too. Yeasty. Hoppy. Not any extreme of alcohol (5%). Dry, dry, dry finish. The Rosé de Gambrinus has a brilliant pink colour, but if you think it is going to be some kind of dessert drink, you’re quickly proven wrong. All the sharp elements of the raspberry seem to be there, with none of the accompanying sweetness. I bought a few bottles, which are sealed with both crown cap and cork, to take home. The gueuze label says you can store it in a cellar until 2030, but I think I probably won't wait that long. How many Belgian beers are there?